With one strange exception, vangas are endemic to the mainland and adjacent small islands of Madagascar. They are found all over the island, being most scarce on the central plateau region where there is scarcely any natural habitat left. 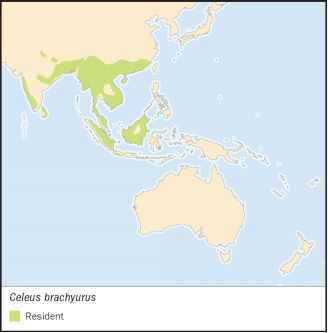 The curious exception to this rule is that of two populations of blue vangas in the Comoro islands, 125 mi (200 km) from the Malagasy mainland. The presence of this species in the Comoros is all the more remarkable given the fact that it is one of the more forest-limited vangas, never being seen far from the forest canopy in the west and east of Madagascar. It is very difficult to imagine such an apparently sedentary and habitat-limited species suddenly setting out over the open ocean, particularly when there are so many other more mobile species (in particular Chabert's vanga) that might have been expected to make the journey.